On the final day of this year’s Conservative Party conference, we saw a new Theresa May. Firstly, the way she spoke sounded less like the recitation of a boring Downing Street press release, which is how she normally comes across, and more like everyday language. Secondly, her entry onto the stage, ahead of delivering her conference speech, struck a humorous note, reflecting as it did a fun moment of self-mockery. She “jived” on stage to the music of Abba’s “Dancing Queen”. Her jiving wasn’t the most flowing. I think Craig Revel Horwood would have given her 2 out of 10 at most on Strictly. However, it was a light-hearted moment in which she acknowledged how awkward she looked when she was seen dancing on her recent trips to Africa. 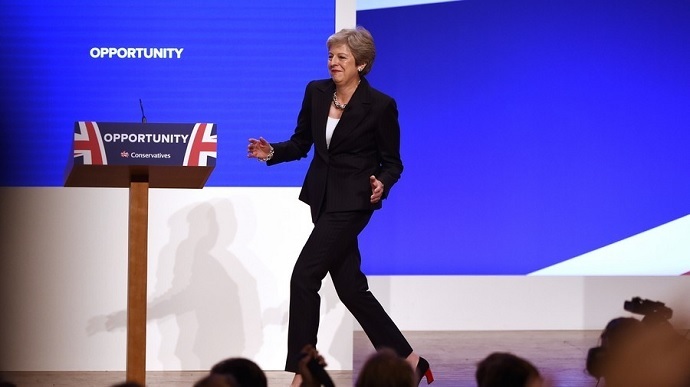 The whole “Dancing Queen” entry was a light touch that worked in her favour. Based on this, I’ve been pondering what other Abba songs might pop up in the lives of other politicians. This should be played when President Macron of France completes his speech to his party’s annual conference and invites his wife on stage to join him in acknowledging the audience’s applause. After all, his wife is 24 years his senior and, from what we know, they probably exchanged their first kiss when he was a schoolboy and she was his teacher. “I was sick and tired of everything, when I called you last night from Glasgow”. This might be a suitable song for Nicola Sturgeon to play on her iPad when she wakes up in the morning after making a late-night phone call to Theresa May urging her to allow a second referendum on Scottish independence only to be rejected firmly by the prime minister. As a member of the public, this is probably the music you should hear while you’re waiting for a phone call you are making to your local council to be answered, when you want to complain about the ridiculous number of potholes on Britain’s streets. This is the song that should be played to Michel Barnier when Brexit negotiations are on the brink and a “no deal” looks like the only option. “I figured it made sense. Building me a fence”. That’s the end. I hope this blog is not my “Waterloo”! !